Slonaker Personal Injury Lawyer Will Laying Down Your Motorcycle Help You Avoid Being Injured? Will Laying Down Your Motorcycle Help You Avoid Being Injured? Will Laying Down Your Motorcycle Help You Avoid Being Injured? Many motorcyclists believe that laying down their motorcycle during a crash will help them avoid injury. This technique is taught in motorcycle safety classes several years ago. However, it is proven that this practice doesn’t help in a crash, and it can actually make things worse. Here’s what you need to know. When motorcycles were first manufactured, the braking systems were not very advanced. They also didn’t have a sophisticated maneuverability, which made them difficult to handle, especially in a crash. Therefore, it was recommended that motorcyclists lay their bike down in an accident because the chances of being able to stop the bike through braking or maneuvering the bike to avoid the crash were very low. With today’s technology, motorcycles have become as advanced as vehicles and have much better braking systems and maneuverability, making it unnecessary to lay the bike down in the case of an accident. Motorcycles now have anti-lock brake systems, tires with better traction, and more maneuverability. Although these injuries can occur in accidents when the bike is not laid down, there is a much higher risk of them occurring if the bike is laid on the ground before or during an accident. 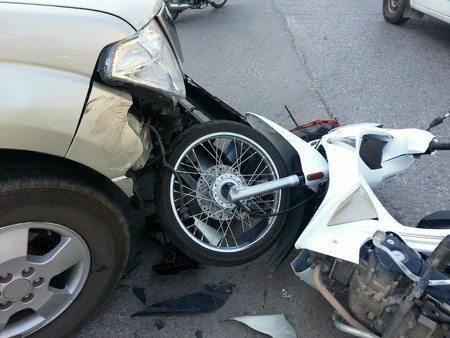 Many motorcycle crashes are caused by the negligence or carelessness of another driver. If you or a loved one were hurt in a motorcycle accident, reach out to a seasoned personal injury attorney to learn more about your legal options for obtaining compensation. Call the Slonaker Law Firm today for a consultation at 352.629.6656 or 352.777.8176.